Edited by Åbäke, Ryan Gander, Dorothea Strauss. Texts by Chris Evans, Douglas Fogle, Ryan Gander, Midori Matsui, François Piron, Dorothea Strauss, Richard Wentworth. Published by JRP Ringier with Thea Westreich/Ethan Wagner Publications, Christoph Keller editions. The Catalogue was conceived by the graphic design collective Åbäke as a "reasonable alternative" to a catalogue raisonné, i.e. a monograph giving a comprehensive and exhaustive catalogue of artworks by an artist. Documenting over 500 works made over ten years, the publication is intended to be navigated freely and illogically, in a non-linear fashion by its reader, echoing the "para-possible thinking" and "associative methodologies" on which much of Gander's practice is based. The book consists of two sections. 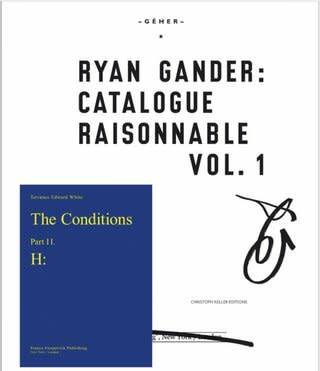 The first is a complete index/catalogue of the artist's practice, while the second is made up from a collage of by-products, off-cuts, transcriptions, scripts, conversations, and material related to the works in the index.